The “just right” binding properties of a monoclonal antibody from an Ebolavirus survivor help it neutralize the virus. Targeting just one region of an Ebolavirus protein with a monoclonal antibody can protect nonhuman primates from disease, according to a study of antibodies derived from an Ebola survivor’s immune cells. The results, published today (February 25) in Science, describe two Ebolavirus-neutralizing antibodies produced by a survivor of the 1995 outbreak in the Democratic Republic of Congo. 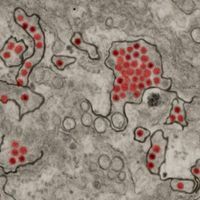 One of the antibodies, whose unique binding properties are characterized in a companion paper also published today in Science, completely protected Rhesus macaque monkeys five days after infection with the virus. “There’s been a lot of activity in the past year isolating monoclonal antibodies from human subjects,” said James Crowe, an immunologist at Vanderbilt University in Nashville who coauthored another recent study identifying antibodies from survivors of the 2007 Ebola outbreak in Uganda. 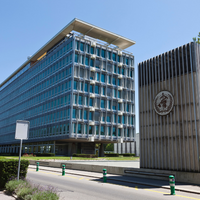 Crowe said the new studies in Science are unique because they show that a single monoclonal antibody can be an effective treatment for Ebola; most antibody research has focused on cocktails of antibodies, such as ZMapp, a therapy now in human trials. Nancy Sullivan, the chief of biodefense research at the National Institute of Allergy and Infectious Diseases (NIAID) and a coauthor of both new studies, said it’s taken her group a decade to zero in on the exceptional antibody, called mAb114. Her team initially sorted memory B cells from a survivor’s blood sample donated in 2006—more than 10 years after his infection. Sullivan said her team recruited the survivor because he experienced a long illness and helped treat patients after his recovery, prolonging his exposure to the virus. “We thought the probability was high that he might still have neutralizing antibody circulating,” she said. 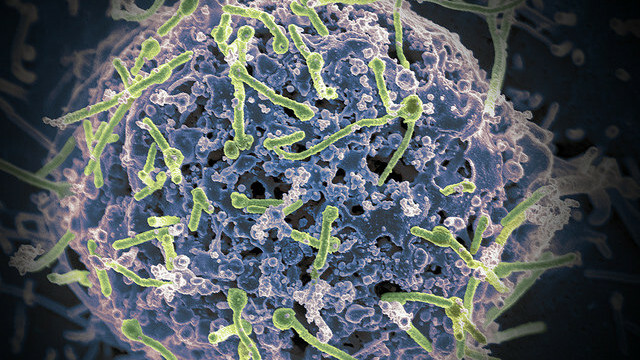 The NIAID team focused on four B-cell clones that made highly neutralizing antibodies against Ebolavirus. After isolating the antibodies’ genetic sequences, the researchers inserted the genes into cell lines to produce large quantities of the protein. They tested two of the antibodies, mAb100 and 114, in three macaques infected with a lethal dose of the virus. Macaques that received two doses of the antibody combination starting one day after infection survived with no detectible virus in their blood, a finding Sullivan and Crowe found surprising. “Most of the antibodies that have been tested in the past have allowed virus breakthrough,” Crowe said. The researchers then tested mAb114 alone and found it also protected the macaques from disease. The treatment worked whether the monkeys received it one or five days after infection, suggesting the therapy could be protective days after exposure to the virus. Monkeys treated with mAb114 alone experienced transient viremia, but had no other symptoms. In the companion paper describing mAb100’s and 114’s structures, Sullivan and her colleagues detailed the locations at which the two antibodies bind the Ebolavirus glycoprotein (GP), which the virus uses to escape endosomes and lysosomes after it’s been engulfed by a host phagocytic cell such as a macrophage. To leave these compartments, a binding site on the mushroom-shaped GP has to interact with a protein found on endosomal and lysosomal membranes called NPC1. But that site is covered up by the “mushroom” cap until the cell’s own proteins lop it off, Sullivan said. The NIAID team found mAb100 binds the protein’s stalk while mAb114 binds a region that spans part of the cap and part of the stalk. 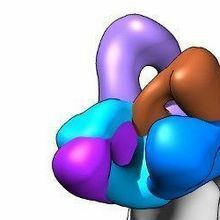 Usually, by the time the NPC1-binding site is exposed inside a cell’s endosome or lysosome, it’s no longer accessible to antibodies, and those that are bound could fall off in the highly acidic environment. But mAb114 is tenacious; it remained bound to the GP even in acidic conditions. “It’s really, really stable,” Sullivan said. The real secret to mAb114’s success may lie in its ability to remain with the GP stalk after the cap is cleaved, a point at which other cap-bound antibodies fail. By analyzing crystal structures of mAb114 in complex with the GP, Sullivan and her colleagues found that the antibody resides in a perfect position to block the NPC1 binding site. They confirmed this by showing that mAb114 competes with NPC1 for GP binding. Sullivan said NIAID plans to test mAb114 in phase I clinical trials and search for more neutralizing antibodies from other survivors and vaccine recipients. According to Laura Walker, a scientist at the New Hampshire-based biotech company Adimab, it is important to wait at least several months before searching survivors’ blood for neutralizing antibodies. “The antibody response needs time to mature,” she said. Walker and her colleagues recently coauthored a survey of 349 human anti-Ebola antibodies, several of which the company is moving into nonhuman primate studies. She said that although a single monoclonal antibody such as mAb114 is promising, an ideal antibody therapy should include several antibodies that can neutralize multiple species of Ebolavirus because antibody combinations reduce the risk of the virus escaping detection through epitope mutation. 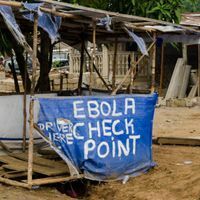 Although the most recent Ebola outbreak has waned, Sullivan and Crowe agree the efforts to develop human antibody therapies should be seen through clinical trials in preparation for potential future outbreaks. D. Corti et al., “Protective monotherapy against lethal Ebola virus infection by a potently neutralizing antibody,” Science, doi:10.1126/science.aad5224, 2016. J. Misasi et al., “Structural and molecular basis for Ebola virus neutralization by protective human antibodies,” Science, doi:10.1126/science.aad6117, 2016.